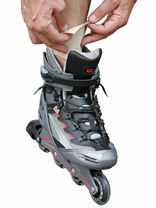 1 per pack, can be used on either the left or the right foot. 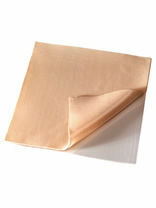 The patented Epithelium Flex allows the strightening up of the big toe. Measurement across the metatarsal head: Small=21.5cm, Medium=23cm , Large=24.5cm. 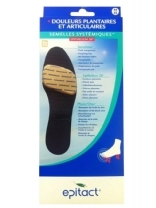 The Epitact Plantar & Bunion Pad is a gel sleeve which provides excellent protection for the ball of the foot and bunion area. Epitact answers to the care, comfort and well being of the foot. 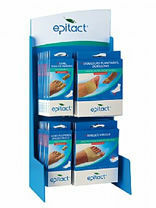 Epitact provides answers to anyone concerned with the care, comfort and well being of their feet - be it foot pain, excessive pressure, friction or rubbing, calluses, plantar warts... Epitact provides solutions. Epitact products derive their features from Epithelium, a unique patented silicone gel whose properties provide a substitute for the human footpad and other human tissues. Epitact provides biomechanical, cosmetic and dermo-mechanical products for both the allied health practitioner and for the general public. REQUEST RETAIL PRICES IN THE "COMMENT" BOX AT CHECKOUT.